Washington and Lee University will name its new indoor athletics and recreation facility for Richard L. Duchossois, of the Class of 1944, in recognition of his leadership support of the project. The Richard L. Duchossois Athletic and Recreation Center includes a restoration of the existing Doremus Gymnasium and a rebuild of what has been known as the Warner Center. The design phase of the facility, which was approved by the W&L Board of Trustees in February 2017, is nearing completion. Pending final authorization by the Board of Trustees in February 2018 and the completion of fundraising by June 30, 2018, construction, by the firm of Whiting-Turner, will begin in the summer of 2018. The facility is expected to be completed by the summer of 2020. W&L President Will Dudley, who made the announcement, said that the name was a fitting tribute to a man who has been steadfast in his support of Washington and Lee’s athletics programs, including leadership gifts to the Duchossois Tennis Center, completed in 1997, and the Wilson Field renovation, completed in 2008. Duchossois, founder of Duchossois Industries, Inc. and chairman of Arlington Park Race Course, noted the importance of athletics in developing leadership and teamwork among W&L’s students and graduates. The restoration of Doremus will occur during the summer and will be scheduled around the university’s academic calendar to allow for use of the fitness center, and Doremus gymnasium will remain available for use by the varsity wrestling program. The former Warner Center will be demolished to its foundation, and the new facility built on the current site. 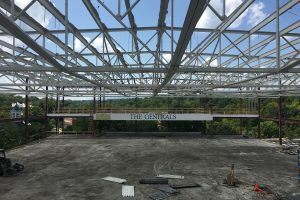 The entire project will encompass 165,489 square feet and will capture over 10,700 square feet of assignable space for new athletic and recreation programs. The addition of a new natatorium across campus next to third-year housing has allowed for additional space within the facility that will increase from two gyms to three gyms, including a new gym devoted solely to intramural and recreational use. The project will also increase the square footage for the fitness center by 32 percent and will relocate and expand the wrestling room by over 84 percent. It will also allow the racquetball and squash courts to become regulation size, while doubling the scope of the athletic training facilities. Other key features of the facility will include greater handicap accessibility, a showcase for the Athletic Hall of Fame, an increase in locker room amenities and features, expanded golf practice facilities, expanded multi-purpose facilities for group exercise, and improved offices for coaches and athletics staff. While the rebuild and restoration takes place, the offices for the W&L Department of Athletics will be housed in Baker Hall, with indoor athletic teams (basketball, volleyball, wrestling) competing on a temporary court that will occupy two of the four courts at the Duchossois Tennis Center. The Pavilion will also support a wide range of additional athletics, physical education, clubs, and recreational activities. In addition to his support for W&L, Duchossois is known for his many other philanthropic interests, including the Beverly T. Duchossois Cancer Laboratory at the University of Chicago Hospital, named for his late first wife, and the National WWII Museum in New Orleans. After Duchossois entered the service as a second lieutenant in the Army Reserve in 1942, he was assigned to a new unit, Tank Destroyers, where he served as a captain and a company commander for all five European campaigns. He was seriously wounded at the bridgehead on the Moselle River, but recovered enough to return to his outfit and command them during the Battle of the Bulge. He received other citations for his actions in addition to the Purple Heart. After the war, he left the service as a major in the infantry reserve. In 2014, on the 70th anniversary of D-Day, Duchossois was inducted into the French Legion of Honor, and he received other combat decorations. His other honors include the American Jockey Club Medal, three Eclipse Awards, and induction into the Chicago Sports Hall of Fame. He and his wife, Judi, received the Sword of Loyola award from Loyola University Chicago for their exceptional dedication to philanthropy and humanitarian service. Duchossois was awarded an honorary Doctor of Laws degree from W&L in 1991. In 2015, he became the fifth recipient of the university’s prestigious Washington Award, which the W&L trustees established in 2001 to recognize extraordinary acts of philanthropy in support of W&L and other institutions, and distinguished leadership and service to the nation. Duchossois’ daughter, Kimberly T. Duchossois, is a trustee emeritus of W&L, and her son, Tyler R. Lenczuk, is a member of the Class of 2008.